There are many System Resource Monitoring application/widgets for Windows 7, but all need space on your desktop or you need to keep them floating on top of all the open windows. 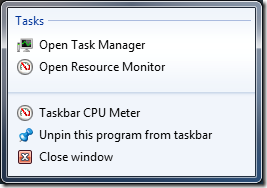 Taskbar Meters solves the problem of utilizing your desktop space by adding the Resource Monitors in the Taskbar. Taskbar Meters comes is a set of three applications viz. CPU utilization, Memory utilization and Disk IO. The developers have put in great brains to make sure that using the application remains simple and you customizable. You can change the update frequency and the percent frequency at which the colors should change between green, yellow and red. 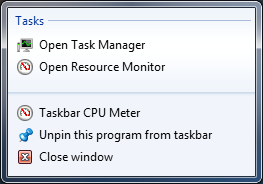 It provides Quick Access to Task Manager and Resource Monitor by right-clicking the icon in the Taskbar to determine what’s slowing down your computer.